This Mediterranean-inspired dish has a fresh, clean flavour with just that tell-tale hint of aniseed from the Pernod. Preheat oven to 200°C, gas mark 6. Finely slice the fennel and place in a bowl of iced water until ready to serve. This allows the fennel to become very crisp. Cut 2 x 40cm squares of foil and 2 squares of parchment the same size. Line the foil with the parchment. Using a sharp knife, slash the sea bass fillets 4 or 5 times across the skin. Take half the dill and rub into the slashes. Season. Place a fillet onto a square of parchment paper and foil, skin side down, then top with another fillet, skin side up. Repeat with the remaining fillets. Sprinkle each with 1 tbsp of Pernod and fold up to form a packet. Bake for 15-20 minutes, until the sea bass is opaque and just cooked. Pour the olive oil into a small saucepan, add the garlic, tomatoes and olives. Warm gently for 2 minutes and set aside for the flavours to infuse. Drain the fennel and toss in the lemon juice, then divide between two plates. 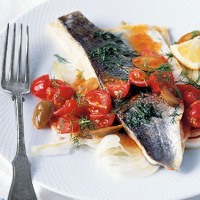 Remove the sea bass from the oven, and serve onto the plates. Discard the garlic from the dressing and drizzle over the sea bass and fennel. Serve scattered with the remaining dill and a squeeze of lemon. Delicious with warm, buttered baby new potatoes.